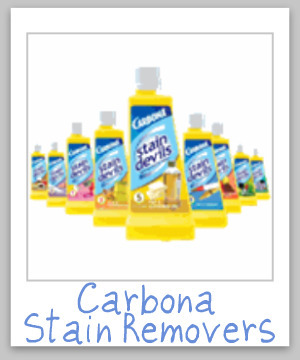 Carbona stain remover is not really one stain remover, but is comprised of nine different formulas of removers, each designed to remove a certain category of stains from fabric and clothing. Each of these formulas is known as a Carbona Stain Devil, and assigned a number, from one to nine, indicating the broad types of stains it is formulated to remove. 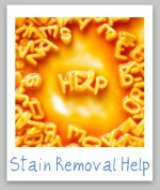 I like the fact that these stain removers do not attempt to claim they universally will remove any stain, but instead the nine formulas acknowledge the true and simple fact that different types of stains need different types of treatments for removal. 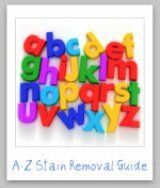 These stain removers are designed for washable fabric only, and should not be used on carpet, upholstery or leather. Below I give a brief synposis of the nine formulas, what types of stains they are designed to remove, and how to use that formula properly. Further, you can scroll down to the bottom of the page to get my tips for where to find and buy these products, which can be difficult to find in stores. This formula is designed to remove adhesives, such as tape and glue, and also to get rid of some tough stains like candle wax, chewing gum, nail polish, paint, and correction fluid. The formula will not remove super glue. To use it you soak the stained area of the fabric in the solution for 10-15 minutes, and then rinse with warm water. Especially large or stubborn stains may need a few separate soakings. 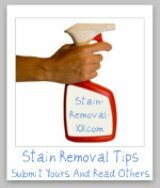 In this stain removal tip about removing nail polish stains from carpet the person suggests using this Carbona stain remover formula. Please note, however, that this product is not formulated for carpets, but instead only for washable fabric, so if you choose to use it in this way, do so with caution. You can click here to purchase formula #1 . This Carbona stain remover is designed to remove condiment stains, such as ketchup, mustard, barbecue sauce, gravy, mayonnaise, pizza sauce, salsa, tomato sauce, soy sauce, steak sauce, and spices. It also removes chocolate stains. To use it apply directly to the stained portion of the fabric, and tamp lightly to help remove the stain, and then rinse with warm water. 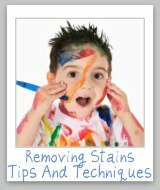 If the stain is large you may also want to use it as a presoaking solution. You can click here to purchase formula #2 . This formula is designed to remove ink stains, such as ballpoint pen, markers, felt tip pens, and roller ball ink. In addition, it is also designed to remove crayon and pencil marks. You can click here to purchase formula #3 . This formula is designed to remove protein type stains, such as blood, eggs, milk, ice cream, yogurt, sour cream, and baby formula. To use it soak the stained fabric in the solution for up to two hours, being careful not to let the solution dry onto the fabric. It works best on protein stains which have not been previously washed or run through the dryer. 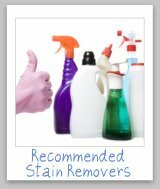 I personally love this formula for removing blood stains. You can read my review and experiences with formula #4 here. In addition, another reader recommended it for formula stains on dry clean only garments here. In addition, you can click here to purchase formula #4 . This Carbona stain remover is wonderful for those who work a lot in the kitchen, because it is designed to remove fat and grease stains, such as butter, margarine, cooking grease and oil, and lard stains. To use it apply directly to the stained portion of the fabric, and tamp lightly to help remove the stain, and then rinse with warm water. You can click here to purchase formula #5 . This formula is designed to remove outdoor stains, such as grass, dirt, mud, clay, and pollen. In addition, it removes makeup stains, such as lipstick, mascara, and blush. Finally, it also is formulated to remove toothpaste and food coloring stains. You can click here to purchase formula #6 . This formula is designed to remove some really tough automotive and mechanical type stains, such as machine oil and grease, motor oil, lubricant, tar, gasoline and diesel. In addition, it is formulated to help remove other tough stains, such as ash, soot, shoe polish, tree sap and Vaseline. It also can remove greasy stains such as lotion, inculding sun tan lotion and oil. You can click here to purchase formula #7 . This Carbona stain remover may be the most popular, because it is designed to get out many types of beverage stains, such as red wine, tea, coffee, juice and colas. In addition, it works well on many other types of food related stains, such as baby food, fruit, jelly and jam, syrup, and vegetables. Further, it is also formulated to get some nasty tannin and protein based stains out, like vomit, nicotine, urine, and general clothes yellowing. Finally, it works to remove stains caused by mold, mildew, self tanner, and perfume. Unlike many of the other formulas which should be applied directly to the stain, No. 8 needs to be diluted. You use it by making a stain removal solution of two tablespoons of this Carbona stain remover, along with 2 cups of hot water, and then soak the stained fabric in it for about half and hour, and finally rinse with warm water. You may need to soak a couple of times for particularly stubborn stains. You can click here to purchase formula #8 . This final Carbona stain remover formula is designed to remove rust, deodorant stains, and perspiration and sweat stains. To use it soak the stained fabric in the solution for up to two hours, being careful not to let the solution dry onto the fabric. You can click here to purchase formula #9 . Free Resource: Here is a stain chart (opens a PDF in a new window), provided by Carbona, which shows all the uses of the various Stain Devils, for common types of stains. 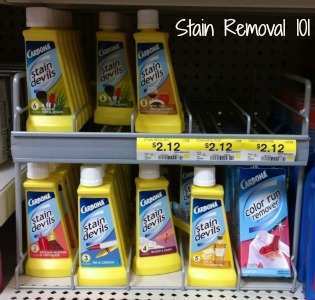 These stain removers are very difficult to find in stores, at least in my experience. For example, I have never seen them in any of the stores I frequent around my house, such as grocery stores, Walmart, or other big box stores. *** UPDATE - I did recently see them in my Walmart, and also at the Kroger, but just recently. *** However, I am told that they are carried by a couple of stores, such as some Ace Hardware stores. You can also find then here, on the Internet. You can almost always find them in packs of six, and sometimes you can also find them sold individually. For instance, you can purchase them through the link below from Amazon.com. Would you like to give a review of a Stain Devils product, and tell me how it worked for you? If so, submit your review here, where you can tell me whether it has worked well for you, or not. I'll also them update this page with the information you provide.